Carleton Watkins (1829–1916) is widely considered the greatest American photographer of the nineteenth century and arguably the most influential artist of his era. Best known for his pictures of Yosemite Valley and the nearby Mariposa Grove of giant sequoias, Watkins made his first trip there in 1861 just as the Civil War was beginning. Exhibited in New York for the first time in 1862, as news of the Union's disastrous defeat at Fredericksburg was landing in newspapers and while the Matthew Brady Studio's horrific photographs of Antietam were on view, Watkins's work tied the West to Northern cultural traditions and played a key role in making the once-wavering West a full participant in the nation. Motivated by Watkins’s pictures, Congress would pass and Abraham Lincoln would sign legislation setting Yosemite aside as a national preserve, the prototypical “national park” and the first such act of landscape preservation in the world. Carleton Watkins: Making the West American is the first new history of the birth of the national park concept since pioneering environmental historian Hans Huth's landmark 1948 Yosemite: The Story of an Idea. Watkins's photographs helped shape America's idea of the West. His pictures of California, Oregon, Washington, and Nevada, as well as modern-day Utah and Arizona, introduced entire landscapes not just into the American imagination, but to business, engineering, agriculture, government, and science. Watkins's clients, customers, and friends were a veritable “who’s who” of America’s Gilded Age, and his connections with notable figures such as Collis P. Huntington, John and Jessie Benton Frémont, Eadweard Muybridge, Frederick Billings, John Muir, Albert Bierstadt, Asa Gray, and more reveal much about the era’s wealth and its simultaneously awed, scientific, and extractive address of America’s newest (and final) West. Drawing on recent scholarship and fresh archival discoveries, Tyler Green reveals how an artist didn't just reflect his time, but also acted as agent of influence. This telling of Watkins’s story is rich with fascination for anyone interested in American history; the West; and how art and artists impacted the development of American ideas, industry, landscape, and politics. Tyler Green is an award-winning critic and historian. He is the producer and host of The Modern Art Notes Podcast, America's most popular audio program on art, and was previously the editor of the website Modern Art Notes, which published from 2001 to 2014. This is his first book. Drawing on recent scholarship and fresh archival discoveries, Tyler Green reveals how an artist didn't just reflect his time, but also acted as an agent of influence. 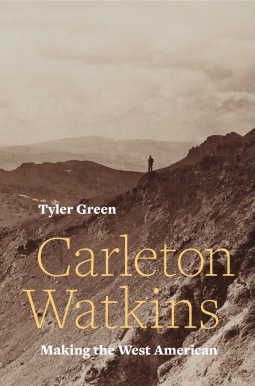 This telling of Watkins’s story is rich with a fascination for anyone interested in American history; the West; and how art and artists impacted the development of American ideas, industry, landscape, and politics. Carleton Watkins is a genius when it comes to photography and although I thought this was 500+ pages of his amazing photos at first glance, this was a very detailed biography. Despite the weight of the book (size of the file?? ), it was an easy read and I just ripped through it. (I was on a 32-hour trip/flight with two stop-overs and this book kept me company for the entire ordeal). Green was masterful in his research and writing style and I wholly think that Lin-Manuel Miranda could fully turn it into another smash hit hip-hop musical. Mr Green? Write more books!! !